It’s early and my bags are packed. Over breakfast, I pull out my iPod and use its Kindle reader to flip through an essay the novelist Henry James once published in the Atlantic Monthly titled “A Chain of Italian Cities,” in which he recounts his journey through the hill towns of Assisi, Perugia, Cortona, and Arezzo. I am loath to leave Rome so soon, but I have spent time here before, and for now I am excited to retrace James’ steps, more than a century later, to some of the lesser known sites in Tuscany and Umbria. It’s a gray morning in Rome as I head by taxi to Termini station to catch the 10:36 AM train to Arezzo, my home base for the next four days. It’s an easy ride, but by early afternoon the dreary sky has opened into a steady rain and I’m relieved that the walk to Piazza Guido Monaco and the Hotel Continentale is short. At just 75 Euros a night, the hotel is a bargain, even if my room does resemble a 1980s college dorm room with its white furniture and floral bedspread. I open the doors to the balcony and look down the street to the right, towards the train station, which serves as a major railway hub, and then left past the piazza towards the historic center of town. 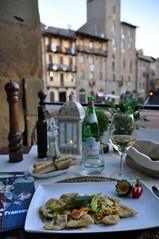 Arezzo is a real city, with real Italians passing by on the sidewalks below. For the first time, I have wandered outside of the tourist corridor that connects the venerable triumvirate of Rome, Florence, and Venice. To be fair, Arezzo is hardly undiscovered—it was featured in the 1997 movie “Life is Beautiful,” which won an Academy Award for best foreign language film—but the city isn’t even mentioned in Rick Steves’ guidebook and that fact alone confers a certain air of adventure. I am striking out on my own, and as usual my stomach leads the way. Just as I arrive at Piazza San Francesco I stumble into Gastronomia Il Cervo and walk through the door to the delight of a jovial man behind the counter. His English is poor and my Italian is worse, but the essentials of communication are achieved with a smile. He recommends a spicy pasta made from stale bread, a warm and hearty choice on a chilly day, and I enjoy a bowl of it immensely in the dining room upstairs, ending the meal with a cappuccino. Feeling fortified, with umbrella in hand I venture back out onto the quiet streets and spend the afternoon lazily wandering from church to church. My first stop, resting on the edge of a lush green park near the ruins of a Medici fortress, is the city’s cathedral, or duomo. There is a beautiful vaulted ceiling lined with frescoes, some stunning medieval stained glass by the famed Frenchman, Guglielmo de Marcillat, and a charming, if unassuming, portrait of Mary Magdalene by Piero della Francesca. 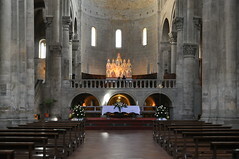 I make my way back down the hill to the Romanesque church of Santa Maria della Pieve to see its Lorenzetti altarpiece, a luminous polyptych of the “Madonna and Child with Saints” painted in 1320. I pop a coin into the light box and stand back to appreciate the effect, watching the figures glow on a ground of gold paint high over the crypt at the end of a long spare nave, under a ceiling of thick wooden beams. At 4:00 PM, I arrive back at Piazza San Francesco and enter the basilica there to see the Bacci chapel, famous for Piero della Francesca’s cycle of frescoes known as the “Legend of the True Cross.” The reservation I made online weeks ago hardly seems necessary, for as in the other churches in town, I am quite alone, save for a pair of young women taking tickets by the door. They direct me past a velvet rope and I savor the space, turning round and round to follow the visual story of the wood that was ultimately used to create the cross on which Christ was crucified. My eyes search for a place to begin. By now, after several summers spent tramping across Europe, I am familiar with the form. 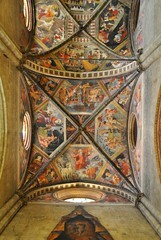 Frescoes like this are made up of distinct scenes that can be read much like a medieval comic strip. With some help from a small book I bought in the gift shop, I follow along: In the beginning, seeds given by Michael the Archangel are planted in Adam’s mouth at the moment of his death, becoming a tree that grows upon his grave. It is later felled by King Solomon and its wood used to bridge a stream. When the Queen of Sheba attempts to traverse the bridge, she has a vision in which she sees Christ killed on a cross made from its beams. The wood is buried, but later found and it fulfills its fate. Centuries later, on orders from the Emperor Constantine, the relic is discovered among the three crosses of Cavalry and its identity restored. It’s been a wonderful afternoon, but my mind is crammed to overflowing and I am eager to feel the cool air upon my face. As I open the door to leave the basilica, I reach for my umbrella expecting rain, but I am greeted instead by a bright blue sky. The storm has passed, and all of Arezzo is reflecting in the puddles it left behind. When Henry James was here in the 1870s, he spent much of the day in an “uninvestigating fashion,” taking in the “general impression” of things. In walking down Corso Italia and its side streets, I now find myself doing much the same. Along the way, I stop at Cremi for a dish of artisanal gelato—a scoop of orange with lime and one of coconut. Its bright, refreshing taste suits both the change of weather and my buoyant mood. I walk further down to San Agostino in time to hear the church bells toll the top of the hour, and then I turn back to the hotel to rest before dinner. When I head out again, I’ve already decided to end the day with a meal at La Lancia d’Oro, a restaurant that spills out under the Vasari loggia, facing Piazza Grande, Arezzo’s most famous public square. 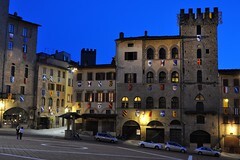 Come Saturday, the sloping pavement will be covered by rows of antiques stands for the monthly Fiera Antiquaria, but for now the view is peaceful and serene, a jigsaw of stone and stucco buildings, each decorated with colorful coats of arms. Believing that the quality of restaurant food is usually in inverse proportion to its location, I truly don’t expect much from dinner, not here in such grand surroundings. I expect tourist fare, so I am stunned when a chain of delectable dishes make their way out of the kitchen, all delivered with warmth and grace by wait staff that treat me like family. I order a bowl of Ribollita to start. It is a Tuscan specialty I have longed to try, a soup made with bread and vegetables. But a small plate of appetizers arrives first, unbidden. For a moment, I worry that there has been some costly confusion, but the night is so warm and pleasant and my glass of the restaurant’s private label wine so enjoyable, that I throw caution to the wind and decide the experience is worth whatever the price. I order a fresh plate of asparagus ravioli, but later decline dessert, only to find a trio of pastries brought to my table anyway, followed by a cream pudding. When the check arrives at last, I thank the waiter for what has been my best meal in Italy, ever. It is a prize hard won, given the fine lunch I had in Siena two years ago, and the beautiful plate of gnocchi I once ate in Rome. I peer at it cautiously and then wrinkle my brow. 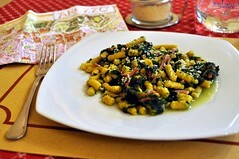 I have been charged for the Ribollita, the ravioli, and the wine, but for nothing more. The rest, it seems, was kindness. In years to come, he would look back and write fondly of the things that populated his Italian Hours. Exhausted, I lean back into bed and close my eyes, knowing that someday I will, too.